Brittany is a former independent kingdom and duchy, and a province of France. It is also, more generally, the name of the cultural area whose limits correspond to the old province and independent duchy. Brittany is one of the six Celtic Nations. It was at one time called "Lesser Britain". Originally a traditional stone and slate farmhouse, our Gite is now a relaxing family holiday home in a tranquil location that can sleep up to 6. 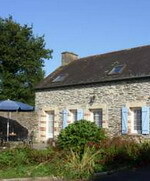 Right in the heart of the rolling Brittany countryside and surrounded by forests, Les Vallées Gite is a 100 year old traditional Breton longere (long-house) stone and slate farmhouse that has been tastefully renovated into a comfortable and relaxing family Gite that will be exclusively yours for your holiday break. The Gite is in a small hamlet of 5 houses situated right in the centre of Brittany on the border of department 22 (Cotes d'Armor) and 56 (Morbihan). We're perfectly situated, only 40 minutes from both the North and South Brittany coasts, as well as having being close to many local attractions within this beautiful part of North-West France. The Gite has retained many of its original farmhouse features such as massive oak beams, carved fireplaces and traditional tiled floors, central heating, satellite TV, double glazing, a dishwasher and power shower. La frogerie is a 160 year old farmhouse, situated in a small hamlet of 4 houses, two miles from the village of Martigne-Ferchaud. A car is essential. The area is known as “la pay de la roches aux fees” (Fairies Rock Country) located in Haute-Bretagne at the doorway to Brittany. 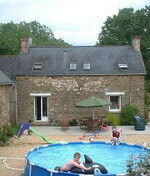 The house is in a very quiet rural location between Rennes and Nantes. It stands in an acre of ground with beautiful views across the fields and countryside beyond. 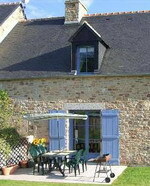 La frogerie has 2 bedrooms that sleep a maximum of 4 adults, 2 children and a baby. The main bedroom has a double bed and bunk beds. The second bedroom has a double bed. In the Kitchen there is a full sized bottled gas cooker, dishwasher, washing machine, microwave, toaster, kettle and fridge freezer. In the living room there is a TV that plays videos only, woord burning stove, sofa's, dining room table and chairs. Sleeps 6.